After selling off aggressively in the front of the week, USD/CAD rebounded as it became clear that no deal will be made at the NAFTA summit in Peru. According to President Trump, a deal is close and the U.S. concession on regional auto content puts them one step closer to an agreement. Mexico thinks a deal will be made in May but a preliminary agreement could happen sooner. This means USD/CAD is still a sell on rallies especially between 1.2650 and 1.2700. The Canadian dollar will be in play next week with a Bank of Canada meeting on the calendar. No changes are expected but there could be a tinge of optimism. The last time they met, the monetary policy statement contained a more cautious tone with the BoC expressing concerns about lower wage and household credit growth. Since then, oil prices hit a 3 year high, retail sales rebounded and job growth accelerated. With a NAFTA imminent, the BoC has less to worry about which could foster optimism from the central bank. Technically, although the 200-day SMA sits right above current levels (near 1.2625), we think that profit taking could drive USD/CAD up to the 100-day SMA near 1.2675. That would be the ideal level to sell as it also coincides with the 50% Fib retracement of the Jan to March rally. Meanwhile 1.2800 should hold as resistance and we view any move toward level as an opportunity to add to short positions. 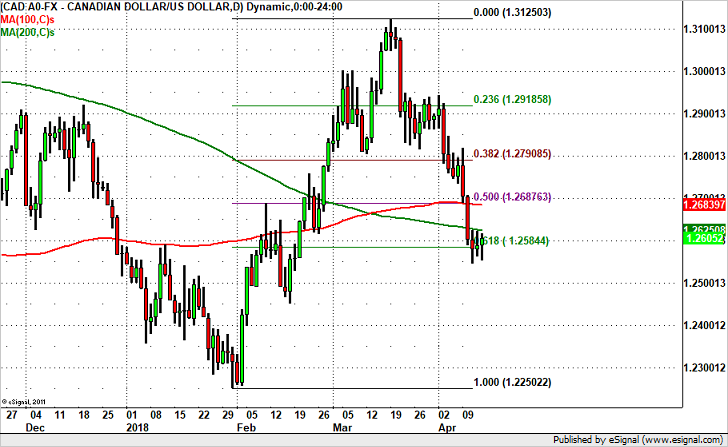 Should USD/CAD break 1.25, the next stop will be February’s spike low of 1.2450. USD/CAD – Will It Break 1.28?